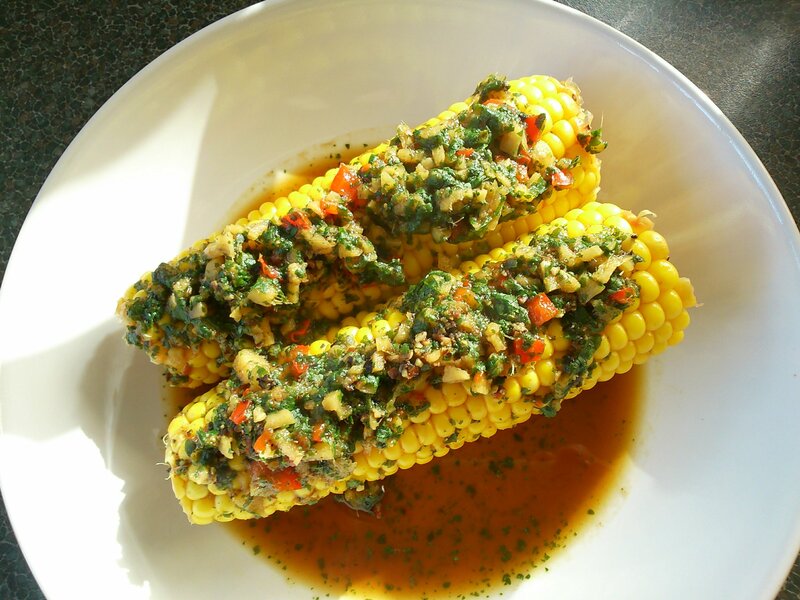 Years ago I used to make a dish where corn on the cob was steamed with soy sauce, ginger and lots of cracked black pepper. I started to get a craving for it the other day, the sweetness of the corn with the heat of ginger and pepper really is gorgeous. But I’m without a steamer at the moment so I thought why not braise the corn in a flavoursome broth, and then reduce the liquid into a glaze. I added a few more ingredients to the original recipe, but it’s still a simple, delicious way of serving corn! The glaze seems too salty on its own, but eaten with the corn balances beautifully. Put all of the ingredients for the glaze in a large saucepan or saute pan (with a lid). Mix together well. Pop the cobs in the pan and place on the hob on a medium heat. Partially cover, and bring to a simmer. Cook for around 6 minutes, turning the cobs every so often to ensure they cook evenly. Turn the heat up to high and bubble until the liquid is reduced by 2/3 (to around 125 ml) mine took around 5 minutes. As the liquid is reducing, roll the cobs around in it to baste them in the lovely flavours. Remove the cobs and transfer to a wide shallow bowl. Stir the coriander through the glaze and spoon the ginger and chilli mixture over the cobs. Pour the glaze around, and finish with a squeeze of lime.